Mathematical models have become a crucial way for the Earth scientist to understand and predict how our planet functions and evolves through time and space. The finite element method (FEM) is a remarkably flexible and powerful tool with enormous potential in the Earth Sciences. 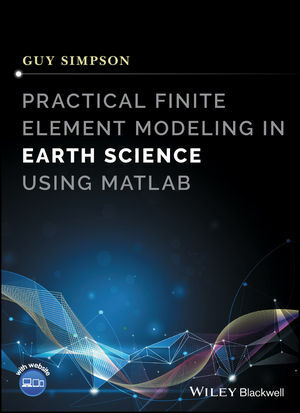 This pragmatic guide explores how a variety of different Earth science problems can be translated and solved with FEM, assuming only basic programming experience. This book begins with a general introduction to numerical modeling and includes multiple sample Matlab codes to illustrate how FEM is implemented in practice. Textboxes have been included to provide additional detail, such as specialized Matlab usage or advanced topics. Covering all the key aspects, this is essential reading for those looking to master the technique, as well as those simply seeking to increase their basic level of understanding and appreciation of FEM. Guy Simpson obtained his PhD in Geology from ETH Zurich. He is currently within the Department of Earth Science at the University of Geneva. Over the past decade, he has taught numerous courses at the Universities of Geneva, École Normale Supérieure in Paris, and ETH Zurich on numerical modeling in Earth science using Matlab. He also uses this method in his own research that includes investigation of earthquakes, tectonics and erosion of active mountain ranges, fluid flow, magmatism, and tsunamis.